Synopsis: Percy Jackson, accompanied by his friends Annabeth Chase, Clarisse La Rue and Tyson, his half brother, go on a journey to the Sea of Monsters to retrieve the Golden Fleece and save Camp Half-Blood. Based on the best-selling “Percy Jackson and the Olympians” book series by Rick Riordan, Percy Jackson: Sea Of Monsters (“Sea Of Monsters”) is an adaptation of the second novel–there are other series that include Percy Jackson as well. With the release of the first film in the franchise, Percy Jackson & The Olympians: The Lightning Thief I proudly stated,”Zeus has every right to strike down upon the Studios behind the production of this film with his lightning bolt, turning them into a pile of rubble and ash.” It’s true, I hated that movie with every fiber of my being, mostly because of what a dreadful adaptation it turned out to be after having read the novel. When a sequel was announced I was in shock, as reception to the first movie was not very good (and not just from yours truly). But every Studio dreams of finding the next Harry Potter franchise and for 20th Century Fox “Percy Jackson” is what they have been betting on. The good news is that Sea Of Monsters is not terrible. Its not brilliant, either, but someone at 20th Century Fox was obviously paying attention to the flaws in the first film and thus called for improvement in the second. The result is a fantasy-adventure story of the quick and dirty kind, without much development of any sort, some fancy special effects, and all-around decent performances by the teen cast, and a couple elders thrown in too. Sea Of Monsters is watchable, even enjoyable for the most part, if you don’t have Harry Potter level expectations. Every Percy Jackson story has the same basic narrative, for those who have not read the books and are unaware of this fact. Percy Jackson (Logan Lerman) is the son of the Greek God Poseidon, and he lives at Camp Half-Blood with other children of demi-gods and the likes from Greek mythology. Percy is special as he is the only child of a full God, Zeus and Hades do not have any living half-blood children because there was a truce put in place years ago where each swore to not fornicate with human women. Obviously, Poseidon slipped up and Percy was born. In Sea Of Monsters, Percy is at a crossroads of doubt as he does not know whether his successful first quest, in The Lightning Thief, was a mere fluke and he is no more special than any other half-blood. His father is not any help as he rarely, if ever, speaks to Percy–its common among half-bloods parents to ignore their children. As Greek Mythology is rooted in quests, a quest soon comes up that must be completed in Sea Of Monsters. The great tree, built from the grave of Thalia, daughter of Zeus who died to protect her fellow half-bloods and protect the Camp, has been poisoned and is slowly dying. The only way to cure her, and restore safety to the camp, is to retrieve the Golden Fleece from an island in the Sea of Monsters that is guarded by the nastiest Cyclops who ever lived. Its going to take more than just a group of half-bloods to retrieve the Fleece as only a satyr can lead the way–thankfully there are a couple at Camp, including Grover, Percy’s buddy. 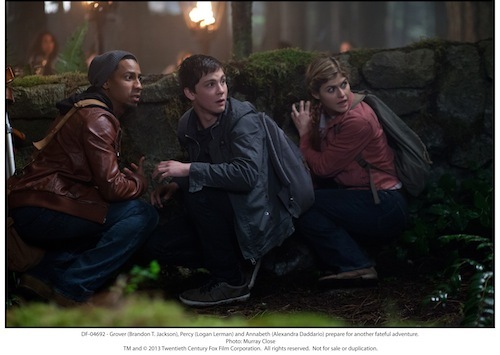 Two groups will head off in search of the Golden Fleece, and Percy will be in one, along with his best friend Annabeth (Alexandra Daddario of Texas Chainsaw 3D) and Grover. Whether they succeed or fail is important, but the greater story leads on to the next installment in the franchise, a prophecy that a child of a God will either protect or destroy Olympus. All eyes are on Percy, but he may not be the only living child of a God after all. For readers of the novel you must prepare yourself for drastic changes in Sea Of Monsters. Its a very bare bones approach to adapting the novel and a great deal of the story has been cut out. If you can look past this fact the movie has just enough action and adventure to satiate the mind and keep one entertained. There are battles between mythical monsters, sly humor between characters, and for the history buffs who enjoy Greek Mythology playful anecdotes and characters that are an added bonus to an otherwise basic teen adventure story. There is not much weight to the story, even with Percy’s self-doubt–that is quickly cast aside once the quest is set in motion. Sea Of Monsters is idle fare; it won’t break any boundaries or have you craving more with the third installment. Its also not going to feel like a waste of time. Logan Lerman (The Perks Of Being A Wallflower) has improved vastly as an actor since the first film and his maturity can be seen in Sea Of Monsters making Percy a much more interesting character to watch, even without a great deal of substance provided his character. There is the inclusion of Percy’s Cyclops brother Tyson (Douglas Smith), who looks a great deal like Brendan Frasier in Encino Man, that lends a moral thread to the plot about accepting people for who they are, and not giving in to preconceived notions or stereotypes. Its not a bad thing to include this in a movie aimed at a younger demographic. A pre-determined romance with Annabeth is all but left out of Sea Of Monsters; in its place is a much more interesting tale of lust for power, and the mighty Kronos. 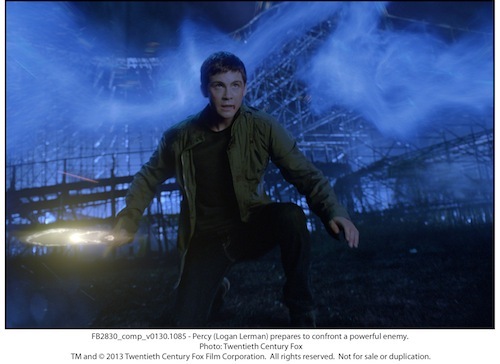 Percy Jackson: Sea Of Monsters gives hope that future installments in the franchise can only keep on improving, and that the world Rick Riordan created in his novels will finally be given their well-deserved due. Until then, Sea Of Monsters makes for a satisfactory effort. There are many ways to have fun with Greek Mythology when it comes to creating special effects thanks to all of the otherworldly creations rooted in the myths. 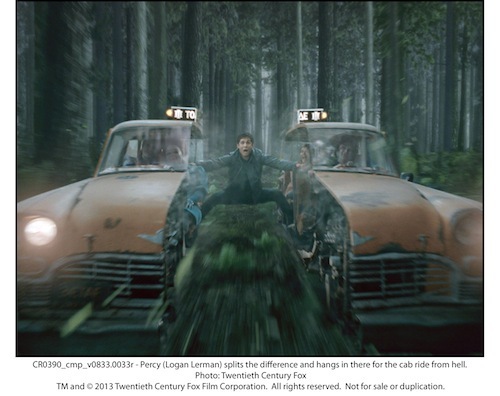 Sea Of Monsters does a great job of rendering effects that are lifelike but fantastical at the same time, making the adventure of Percy’s quest more exciting. You have of course Tyson the cyclops–a one-eyed teenager whose one-eye looks real; seriously, you would never know it was an effect crafted on a computer using CGI unless you really look hard when the angle is not perfect on his face. It’s actually very cool to look at Tyson’s face, and quite distracting, as it should be…he is a one-eyed cyclops! The fun only begins there. How about a burning furnace-like bull made out of gold metal that has tectonic style plates covering his body and horns that would make you scream, as the characters all do in Sea Of Monsters. Catching a cab will never be the same after the crazy ride Percy, Tyson, Annabeth, and Grover take with the Gray Sisters. They all drive the magical cab, with one eye. That eye, its never where it should be, so be prepared to watch an eye get tossed about and used as a weapon for information. The effects in this scene are great, and culminate with the cab splitting in two, as shown in the photo below. You get a great deal more special effects throughout Sea Of Monsters, including a rendering of the great Kronos, brought back from the dead at the bottom of Tartarus. He’s big, red, and glowing, with pieces of his body that float back and forth together creating a puzzle-like creation for your eyes to behold. Then there is the Bermuda Triangle, aka Sea of Monsters, and the whirlwind of surprises that await, including (friendly) zombies. Or Hermes’ factory, where not only do you get a dazzling display of the postal service of Olympus but Nathan Fillion, of “Castle” and “Firefly,” provides a great deal of comic relief, and talking snakes too. Sea Of Monsters may be short on story, but it makes up for it in special effects that dazzle you throughout.